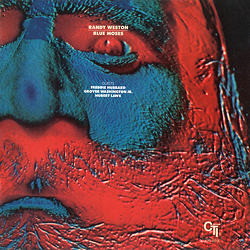 "Blue Moses" - Randy Weston (p); Don Sebesky (arr); Grover Washington, Jr. (ts); Freddie Hubbard (tp); Garnett Brown (tb); Alan Rubin (flh); Hubert Laws (fl); George Marge (english horn, cl, fl); Ron Carter (b); Bill Cobham (dr); a.o. ﻿Randy Weston – now an elderly gentleman and one of the few living witnesses and co-creators from the heyday of hard bop – still leaves his home in Brooklyn to tour through Africa, Europe and Asia. A truly multicultural man. His percussive style has been influenced in particular by the ethnic music of Morocco; his amazing sense for the sounds produced by North-African melodic and rhythmic instruments has enriched his music over many years. After seven years without making any recordings, "Blue Moses" was recorded in 1972 in Rudy Van Gelder’s studio. Lengthy trips through North Africa and as far as the Niger, plus the ignorance of American record companies, were the reasons for the long pause. Finally the CTI producer Creed Taylor took an interest in Randy Weston and financed a large ensemble with Don Sebesky as arranger. The four themes provide a great basis for improvisations by the soloists, whereby the Randy Weston’s piano takes the lion’s share. The flute is also very prominent – and no wonder: it is played by Hubert Laws. It is quite possible that many jazz fans will have missed the name Randy Weston when flipping through the letter 'W' in record shops in the 70s. Now they have the opportunity to correct this mistake with this re-release.